Whether you’re blogging for yourself or for a monetized audience, getting started is half the battle. It’s not easy coming up with blog post ideas your readers will care about. For starters, your blog posts must add value to the reader. Solving problems, answering questions, and providing insights make your content worth reading and sharing. But on the other hand, you want to write about things that interest you, too. You want to feel comfortable with a topic to do your best work. Your website’s FAQ section is teeming with potential blog post ideas. Addressing their most common questions in a blog can give you more room to expand on solutions. Create how-to guides, product highlights, and other relevant content that adds real value to your readers. Not all blog posts ideas have to be original. In fact, many successful blogs repurpose content in different forms to deliver added value to its readers. Considering taking an information-intensive blog post and turning it into an infographic. Infographics are pictorial representations that display content in a visually-appealing format. These are easy ways to present complex ideas simply. Blog posts with lots of statistics or facts can usually be transformed into an effective infographic. As an added bonus, infographics are digital gold for backlinking and sharing. Because users tend to skim rather than read, infographic content can be preferable to traditional blog posts. Users get more information in less time without missing out on important data. Posting reviews in your blog can help you promote your own products, affiliate products, or just products you like (or dislike). If you want to review your own products or services, remember that the reader may find them biased. It could be in your best interest to include user testimonials, photos, or online reviews to back up your claims. Regardless of the products you review, it’s best to stick to the facts. Show how the products work, their features and benefits, and what results they intend to deliver. Interviews can be highly valuable because they highlight original content not available from any other source. Interview an expert in your field or someone you do business with that can share insights your audience will care about. Tailor your questions to your audience’s needs. You want your readers to glean something from the interview, so consider how your expert relates to them. Also, your interviewee may also help in driving website traffic and sharing the interview on their social channels. 2014 (and 2015 and 2016) was the Year of the Listicle, but this format remains popular among bloggers today. Some blogs have built their entire business on creating Top 10 lists. Readers love them because they’re simple, easy to read, and straight to the point. Readers don’t want to waste time collecting information from various sources. They want to get the biggest impact for the least amount of time. This is precisely why listicles are popular. Studies show that numbered lists are top performers, especially when they feature an odd number in the title. If you’re looking for a way to foster a conversation in your blog, opinion pieces offer an effective vehicle. They offer food for thought, even if your readers don’t agree. A well-constructed rebuttal, experience, or explanation of your take on an argument can help to shed light on specific issues. It also encourages engagement from your readers to weigh in and share their own points. Speaking of engagement, create a poll to get your audience to weigh in. Polls can be valuable for crafting future blog post ideas. For example, you might use a poll to find out which topics your readers care the most about. Remember, blog posts don’t always have to be long-form. A couple of paragraphs and a poll can be just as valuable as a how-to guide or infographic, as long as it helps you reach your goals. Storytelling is becoming an increasingly large tool for marketers. Stories illustrate ideas and make them relatable. They help readers put ideas into perspective and gain a deeper appreciation and understanding of the subject. Don’t be afraid to share a personal story with your readers. You can tie in your unique experiences to a particular subject that helps readers connect the dots. For example, if your blog centers on helping others start a blog, you might share your biggest initial mistakes and how others can avoid them. You don’t have to be a scientist to perform a few experiments to see if a popular fact is completely bogus. Use your existing knowledge and experiences to put a theory or myth to the test. Document each step in your blog post to add credibility to your experiment. Ever wonder how some blogs find time to post five new pieces of content a day? Here’s s a hint: they’re not always creating the content themselves. Many blogs rely on guest contributions to scale their offerings. Guest writers submit original content written specifically for your blog niche and audience. And good news: bloggers are actively looking for blogs where they can contribute. Guest posting helps bloggers to build backlinks and get their name out on other websites. You get free content to build your blog. It’s a win/win! It’s easy to come up with a few blog post ideas, but sustaining that inspiration needs a little extra work. If you start to hit a creative wall, outsource your blog writing to iWriter. 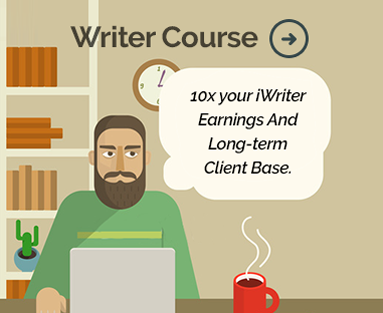 We’ve partnered with expert writers in a variety of niches so you’re never stuck in a rut. Contact us today to learn how iWriter can give you an endless supply of ideas and content.